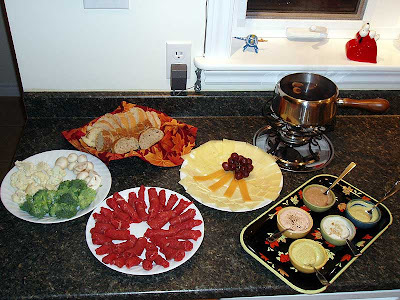 As you can see from the pictures fondue night was awesome. The meat was so tender it just melted in our mouths. That’s not always the case with this meal. We have had some fondues where the meat came out of the broth very tough and chewy. Last night’s was great whether we cooked it for a short time or a long time. This is probably because of the way it was processed. The butcher is also the farmer who raised the cattle. He actually hangs the meat for 21 days in his cooler and then does the cutting himself. This is the way butchers used to do things but it’s not the way they do it at today’s grocery stores. It’s just one more reason to make the trip to the Farmer’s Market. We first had this meal at a restaurant in Montreal years and years ago. They called it a Chinese fondue for whatever reason. The meat was sliced into very thin pieces and was brought to the table on a platter. 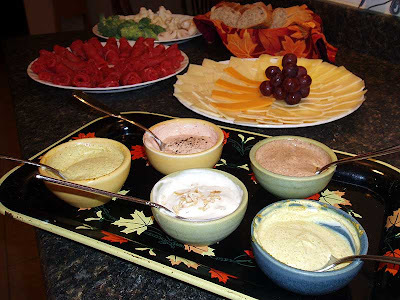 The cooking medium was beef broth and was served with a variety of dipping sauces and bread. It made a big impression with us. Later, at home in Toronto, we found an Austrian restaurant called the Graf Bobby that also offered the same meal. We must have gone there a hundred times and we always had the same thing. It became quite a tradition for us; they even kept our favourite table reserved for us on Friday nights. Unfortunately, the Graf Bobby went out of business so we had to learn how to make fondue for ourselves. It turns out to be surprisingly easy to do. We make all the sauces ourselves. We start with a mix of plain yogurt and sour cream as the base then we add our own blend of spices. Hubby loves the curry sauce so I usually make two. I love the onion sauce. It’s made with a bit of onion soup mix. We tried two new dips this time. We used the chipotle chili spice and the hot paprika we wrote about a couple of weeks ago to make them and they turned out great. They are definitely keepers. If you are going try this yourself make the dips a couple of hours ahead of meal time to let the flavor spread into the base. The veggies are great cooked this way, too. They always add an extra welcome to the broth in the pot. We use the broth a day or two later over some ramen noodles for a quick dinner. We always put out a selection of different cheeses, too. A couple of different breads just make this meal perfect. Hubby got a very nice surprise for Valentine’s Day this morning. 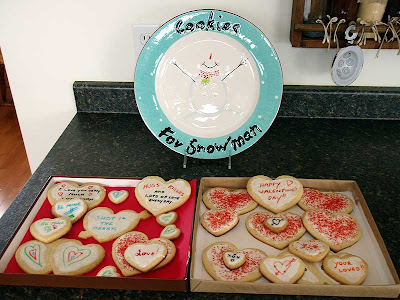 This is the second year I have made these cookies for him. They’re fun to make and are delicious, too. I think he was pretty happy to get them. I think the Snowman is also happy. Hubby made me a great breakfast this morning and now I'm stuffed. I also got a beautiful card and the wine we had with dinner last night was also my Valentine’s gift. I didn't want any flowers this year. Oh, and I just had to include one more picture. 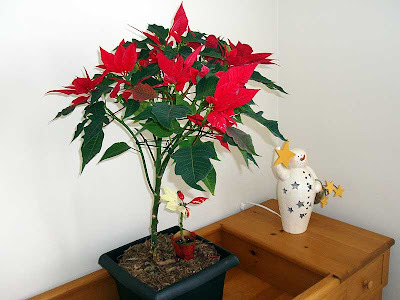 I purchased this beautiful poinsettia tree after Christmas for $5.00 and the colour is such a bright red that I call it my Valentine's tree. That looks sooooo yummy!!! So different than how we do ours though! Do you cut your beef really thinly? We always have it as cubes... and use oil to cook it in... Yours sounds much healthier! 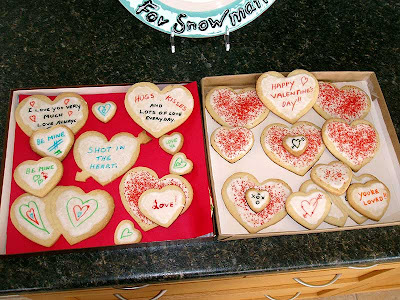 I love those cookies... your DH is lucky!! Love the tree too, it still looks great! We've done the cubes in hot oil style as well but we always worry about a pot full of boiling oil sitting on the dining table. Hubby can be fairly clutzy, at times. Yes, the meat is cut very thinly. Ideally, a deli slicer would be the perfect machine to get this done but who can afford one that is worthwhile having? Besides, cleaning the damn thing would take longer than it would be worth. A nice sharp butcher knife and partially frozen meat produce more than acceptable results. This is where the more tender beef is important, too. The more tender the meat is to start with, the better it handles being a little thicker. Last night's roast was great even though the slices varied from about an 1/16 of an inch to about 1/8 of an inch thick. I mentioned to someone your suggestion about getting a fondue pot for power outages, and a coworker had one they had never used, and gave it to me--Needless to say, this post makes me anxious to use it, with or without power! Your cookies look great too!! Happy Valentines Day!! Once you go "fondue" you'll never go back! Ha! Get the best cut of meat you can, the leaner the better. We normally use "eye of round" because it is so lean. Pour some beef broth into your pot and heat it up and you're good to go! If you have a friendly butcher they might even slice the meat for you on their deli slicer. It's really not necessary but it will be prettier. I agree with you, don't be shy! Everyone should be rooting for their own Olympic athelites! Even if they aren't from Canada! Looks great-kind of reminds me of Japanese Shabu-shabu (swish-swish). You take paper thin cuts of meat, Chinese cabbage, Chrysanthemum greens, enoke and shitake mushrooms and "thick" stemmed long green onions and cook them in a shabu-shabu pot on the table. The you dip the cooked vegetables and meat in a sauce...very yummy. Shabu-shabu sounds interesting, too. Does everything go into the pot at the same time? 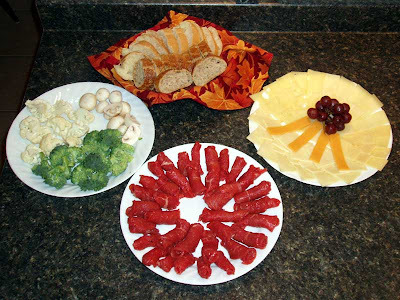 Or, as we do with the fondue, do you put it in piece by piece as you go through the meal? What kind of sauce do you use and where can you get Chrysanthemum greens? that does look good. 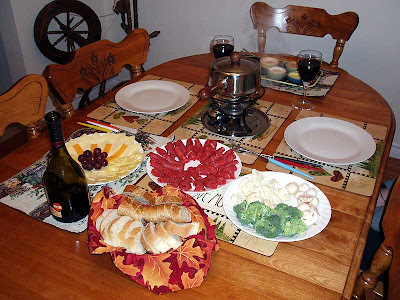 I have never had a fondue, but I think it is something I would enjoy. The cookies also look good as well. The Graf Bobby's broth was amazing, and I want to make something as good as that. They said they used wild mushrooms. Do you have a recipe? The Graf Bobby's beef & wild mushroom broth was so incredibly good. Do you have a recipe for something like that? We don't do anything special for the broth. We just dump in one or more of the tetra style boxes of Campbell's Beef Broth, specifically the salt-reduced variety. I'm afraid that I don't remember the restaurant's broth being particulary remarkable but I seem to recall that they would offer to serve it up in cups after the meal. They would even whisk in an egg to thicken it up a bit. 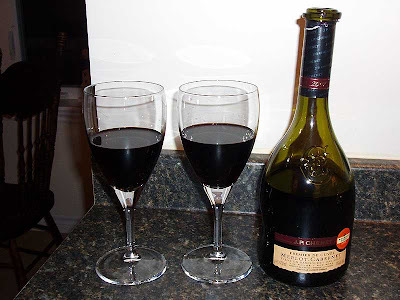 We did drink it occaisionaly and it was very good like that. We even do so at home now every once it a while. What else can you recall about the Graf Bobby? It must be 25 years since it closed but we still talk about it. What picture is on your desk top this month?